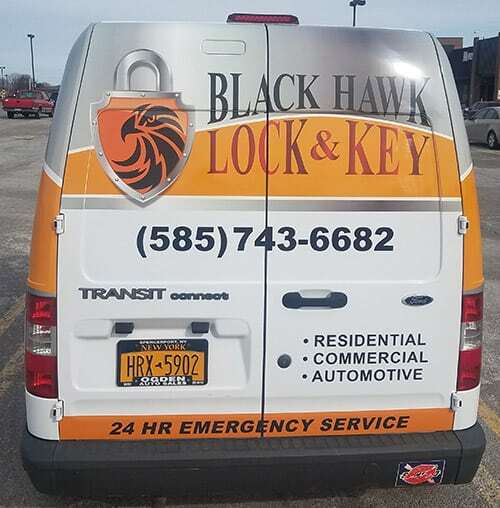 If you own a home, a vehicle, or a business in the Webster region and you need locksmith services, contact Black Hawk Lock & Key. We offer a full array of emergency and scheduled locksmith services, providing you convenience and peace of mind. Locksmith scams abound, and it can be hard to know who to turn to when you’re facing an emergency. One of the most common tactics among disreputable locksmiths is suspiciously low up-front pricing. Too often, these “locksmiths” are unqualified, and their only training has come from watching online tutorials. Not only do they generally end up charging unexpected hidden fees, but rather than properly picking a lock, they simply break the lock. Scammers are generally uninsured, meaning that you’ll likely be on the line for paying to repair or replace the lock. In the end, your discount service ends up costing significantly more time, stress, and money than you’d expected. At Black Hawk Lock & Key, we provide consistently high-quality products and services for area residents. We are the locksmith Webster NY homeowners, drivers, and businesses trust for trustworthy, on-the-spot security solutions and emergency service. We are bonded, licensed, and insured, providing you peace of mind, and our locksmiths receive extensive and ongoing training in the latest security technology. We are members of 1800unlocks and the Fair Trade Locksmith Directory, meaning that we have been carefully screened by a third party for quality and professionalism. We have a mobile service, meaning that we can meet you wherever you are to provide quick help in an emergency lockout. Whether you need emergency assistance or you want to update your current security system with today’s technology, our professional locksmiths are here to help. To learn more about the services we provide or to get fast, on-the-spot help with a lockout, contact Black Hawk Lock & Key. Our friendly, professional locksmiths are here for you, providing peace of mind and outstanding security solutions to meet your needs.